My rats. Yes, rats. I've loved animals my entire life, and rats are no exception. In fact, if you were to ask me whether I'd rather handle a rat or a hamster, I'd hands down pick the rat, as they rarely bite, and I've never owned a hamster that didn't. I've had these two for six months now, and although they were a bit frightened at first, they're very friendly. As they're females, they don't tend to enjoy sitting still and cuddling, they like to explore. But these two love to groom people. Much like dogs, they show affection by licking. They can be noisy during the night due to them being nocturnal, but I generally take them out of their cage (which do not come cheap, mine set me back £85!) around 9PM, so they settle down for when I'm trying to get to sleep. Obviously they don't require the amount of care that a dog or cat does, but this is as long as you house two or more together, otherwise a lone rat would require hours of attention a day. Their upkeep can be pricey at times, though. Like I said, my cage was not cheap, and they require food, toys, treats and litter (a £5.99 bag gets me two full clean-outs). They really do make lovely little pets though! Awww they are so cute!! I've always wanted rats! Had a pet mouse when I was younger, though. I also had a pet mouse, it never became fully accustomed to people though, which was a shame. 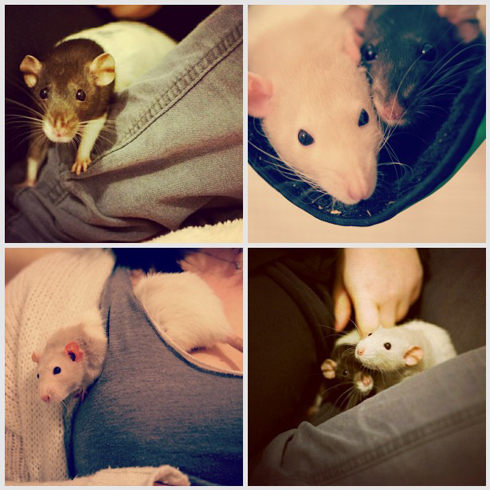 It took me ages to convince my parents about the rats! I love how you named them after Ratatouille characters! Mine are around 8 months now, but we took a visit to a local farm on Sunday and Rolo and Whiskers are tiny in comparison to the 8 month olds they had! Awww! Soo cute! I absolutely love animals too and i hate it how rats get a bad name!!! !people think the are dirty, but rats love keeping themselves clean!!! Great post and i look forward to hearing how they get on!! They're actually really cute! We have 2 rabbits and they're adventurous little things! I just followed you, really enjoyed your past few posts! they are adorable! i use to have mice as a kid. rats are really friendly. Thank you for commenting! Please feel free to leave your own blog link, I love discovering new blogs to read! PaintPotted is a Disney and lifestyle blog written by a 24 year old from Northumberland. © 2015 PaintPotted. Ashleigh Template designed by Georgia Lou Studios All rights reserved.